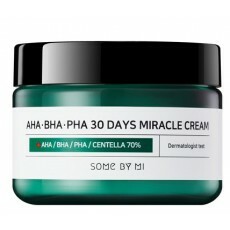 Some By Mi AHA-BHA-PHA 30 Days Miracle Cream is a multi purpose moisturizing cream formulated to repair damaged skin barrier, soothes irritations and prevents acne formation. A strong skin barrier is important to protect the skin from harmful irritants and moisture loss, therefore less sensitivities! contains Asiatica Extracts (Asiatic Acid, Asiaticoside, Madecasic Acid, Madecasoside) in 700,000ppm and tea tree water in 10,000 ppm. Both are powerful anti inflammatory and anti bacterial ingredients to soothe redness, fade acne and acne scars and prevent them from coming back! Apply as the last step of your skincare routine. Take adequate amount and pat on the skin using your fingertips. Give special attention on sensitive areas of the skin.